I love Thanksgiving! But when I took a walk around my neighborhood, I couldn't believe it. The gated entrance is already decorated for Christmas. And several of the neighbors are going all out on Christmas decorations. It's still another week before Thanksgiving and I want to enjoy it. There are many reasons I love Thanksgiving. I love the colors of the season. Fall is such a changing time in nature. Although I live in Phoenix and it's still in the 70's, I'm hoping for a drop in temperatures very soon. And of course, it's only a two hour drive north to Flagstaff where we can enjoy the seasons. I love decorating the house with fall items. I picked up this special pumpkin in Boerne, Texas while visiting my friend Jamie. I love scented pumpkin candles and taking out my copy of "Thanksgiving: A Time to Remember" by Barbara Rainey. I read this book every fall. I would highly recommend it to anyone with children who would like to teach them about the history of Thanksgiving and the Pilgrims in a fun way. I would actually recommend it to adults too. I love having family over to the house for Thanksgiving dinner. This is Greg's family several years ago enjoying our meal. And since we didn't have enough room at the table, the kids had fun sitting together. BTW, these photos were taken about eleven years ago. I have to laugh because Brittney and Sarah who are pictured on the left are both freshmen in high school now. And Julie is a senior in high school and Bryan is in college. LOL. 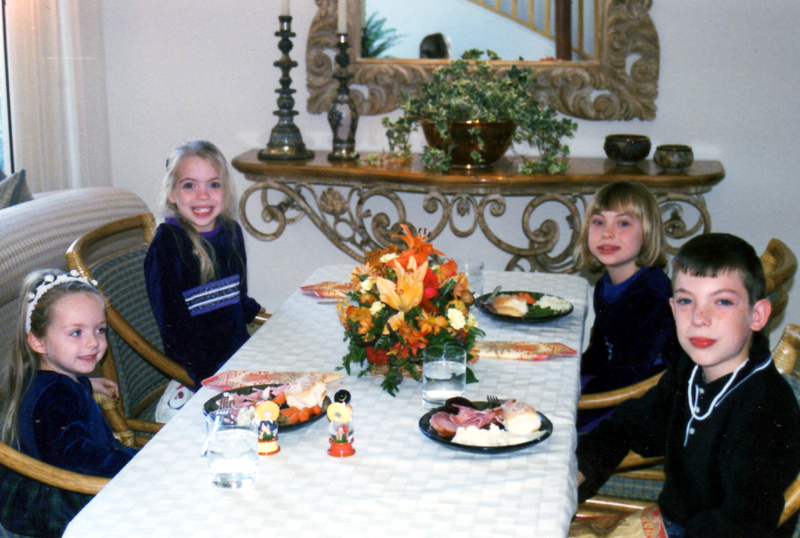 And this photo is of Greg's sister Roxann's children who are all grown up. They live on the east coast so we don't get to spend Thanksgiving with Collin, Jason and Megan. But we miss them. Edie of Rich Gifts offered this free Scripture tag for Thanksgiving. You can get the code on her blog. She is so talented and did my Heart Choices makeover. But I guess I love Thanksgiving so much because it is a time of thankfulness. God has been so good to us in the United States and too often we take our freedoms for granted. Let's cultivate an attitude of gratitude all year round and not just for Thanksgiving. How about you? What do you love about Thanksgiving? Or do you enjoy this time of year? Not everyone can be with family so how do you still find ways to enjoy it? Such a warm post my friend. I bet Thanksgiving at your place is wonderful! I host Thanksgiving and love every minute of it. The smells of turkey and pies baking drive me wild. Having my parents here during the holidays are great. We always try to open our home to those who need a place to go during this time. Usually singles who don't have family around, but lately they have all been getting married off so I think it will just be my family and Kathy and her husband. I love everything about it - from the reason we celebrate it to how our family makes it full of THANKSGIVINGS. Everyone shares what we have been thankful for this year and we thank God for all the things He has done and continues to do for us! I make a delicious vegan dinner and a yummy pumpkin pie! The kids know it is next week and they are already asking for it. It will be Gabriels' first Thanksgiving here with us. That is my favorite part too - is seeing this time through their eyes. It blesses me beyond measure! Praying your Thanksgiving will be blessed and rich with love! Thanks for sharing the wonderful pictures! God's richest blessings upon you and your family this Thanksgiving!! Thanks for the beautiful post. I love seeing happy families gathered around tables. I actually prefer Thanksgiving over Christmas. Thanks for sharing all the things you love about Thanksgiving! I enjoy it too. 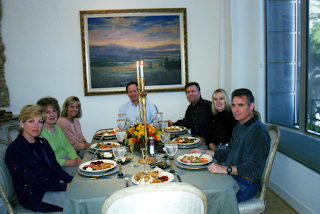 I love being together and the tradition I think of the meal and giving thanks. I like how people want to help others at this time of year too. This is a wonderful post Debbie. I was thinking about the holidays and celebrations between Oct and December and how crunched they are. I think if Christians stopped focusing on halloween and instead, put the focus on Thanksgiving, we would have less stress, a more enjoyable Thanksgiving and Christmas, and maybe help shift the culture. I'm so glad you like the Scripture Tag. I hope you have a wonderful Thanksgiving! Love you! This is a precious message. I felt like I was in your family at the table. 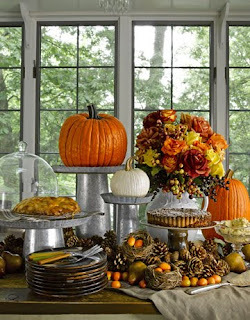 Love your "fall" finds that you decorate your home with. I love Thanksgiving and Christmas for SO many reasons. Too many to list but the primary ones is the LORD, my hubby, kids and now my grand babies and this thanksgiving is extra special because our family is going to visit with another precious family. First time I won't be cooking in MANY years. I love the warmth, and family time of the holidays. I loved all of the photo's you've shared...and your precious words. Praying your month of Thanksgiving is blessed beyond measure. You're Better Off Today Than You Had been 6 Yrs Ago?